One of the greatest issues for sports field management is adequate drainage of stormwater and runoff. 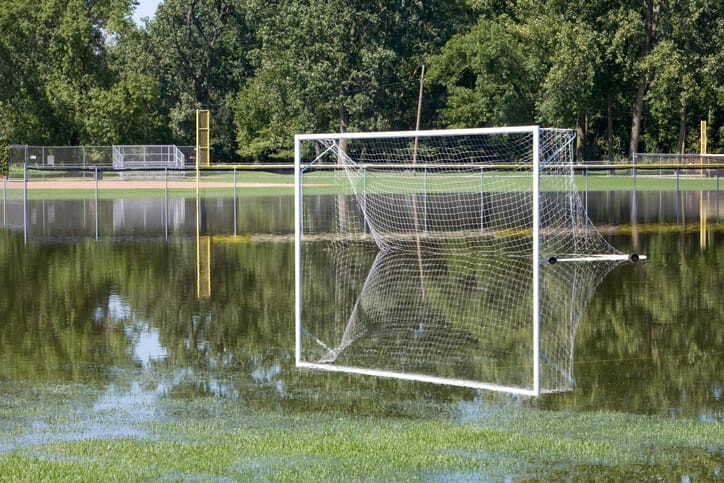 Excess water weakens the turf system and makes surfaces hard or impossible to play on. Draining unwanted water fast is the goal. Technological advancements have made it possible for these fields to be environmentally friendly by utilizing a storm water management system underneath the field. Stormwater recapture systems underneath playing fields are surging in popularity. These systems consist of layers of turf, sand, geotextile, geomembrane along with pipes in order to successfully recycle and at the same time treat stormwater. This carefully engineered system not only captures stormwater but at the same time, treats it and stores it so it can be used for irrigation and other water supply needs. Western Environmental Liner plays a crucial role in the stormwater recycling system. Among our niches is also the fabrication of geomembrane and geotextile needed for these kinds of projects. Our Aqua series of reinforced polyethylene (RPE) geomembrane is perfect for this application. RPE is a fairly impermeable membrane that will prevent water seepage into the ground, allowing it to travel smoothly to its destination. With the geomembrane oftentimes buried in this application, our Aqua series of RPE carries a long term guarantee to ensure system longevity. Western Environmental Liner likewise manufactures permeable needle punch non-woven geotextile for this application that is perfect for erosion control and water treatment as it filters soil, debris and other chemicals out of the stormwater. Our geotextile comes in several gauges and we can fabricate this in our factory to whatever panel size and shape you need saving you time and money in the installation process. Our Aqua series of Reinforced Polyethylene (RPE) geomembrane is long lasting and tough, offering the impermeability to direct water seepage to drainage channels. Our permeable geotextile is perfect for erosion control and filtering stormwater as part of its recycling treatment. Our multiple factories located in Tolleson AZ, Romulus NY and Great bend KS along with our service crews all over the country assures you that we will be able to serve you in a reasonable amount of time. For any questions and inquiries call today and one of our cover and liner experts will be happy to assist you. For any questions and inquiries call today and one of our liner experts will be happy to assist you.